Hiking using smartphone GPS real-time navigation added. See post updates! See also: Aerial View of Bukit Shahbandar | How much water should you drink? A second extended trail is indicated by the lighter red line — to the left of the map. This trail runs over 2 kms, connects the Menara (tower) to P8 and P6 huts, and is largely unmarked. Until the trail gets useful directional markings I do not recommend exploring this part of the forest, solo or otherwise. Here’s an aerial map of the Shahbandar trails to give you a better idea of its vastness and proximity to neighbouring roads and landmarks such as The Empire Hotel & Country Club, Jerudong Beach, etc. Hiking with GPS aided navigation Here’s something even better than a paper map if you had it printed, or a static map if you downloaded it as an image to your phone. I’ve been tracking my workouts using MapMyHike for Android for nearly two years but it was only yesterday when I discovered and tested the app’s GPS navigation capability — in the context of Bukit Shahbandar, I include two mapped trails below from a previous hike (regular and extended distance) of which anyone can choose to add to their app to enjoy a GPS guided hike without getting lost in unfamiliar territory. 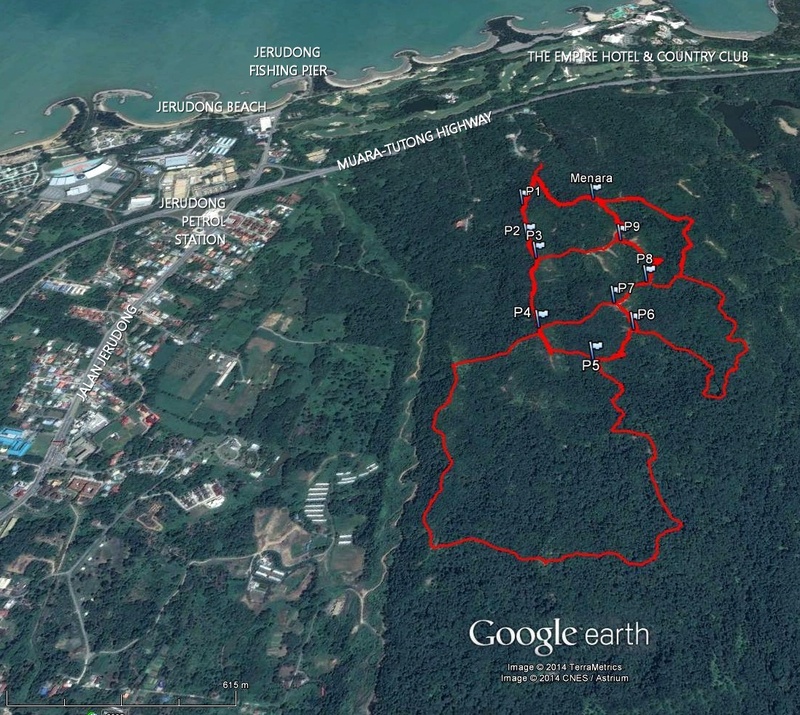 The left screenshot shows an extended trail of Bukit Shahbandar (approximate distance of 6.21 km) before you start your hike. The right screenshot of a trail in Sungai Liang during a hike shows a GPS assisted directional arrow, indicating that I was going the right way. If all goes well, you should receive the following email message. Click OPEN ROUTE and within seconds you should see your selected route appear in MapMyHike mobile app (as shown in image immediately above). Also see Facebook post. Last but not least, SHOES. I have gone through a few pair of shoes to know which ones are most suited for the trail conditions at Shahbandar. I have hiked and I have run the trails on both dry and wet days, regardless of weather, you want to be wearing shoes with good traction. My boyfriend and I were first-time hikers of Bukit Shahbandar and we attempted the hike without much prior preparation. Neither of us were experienced hikers (and we didn’t have any experience hiking in Brunei at all), so we didn’t quite know what to expect. 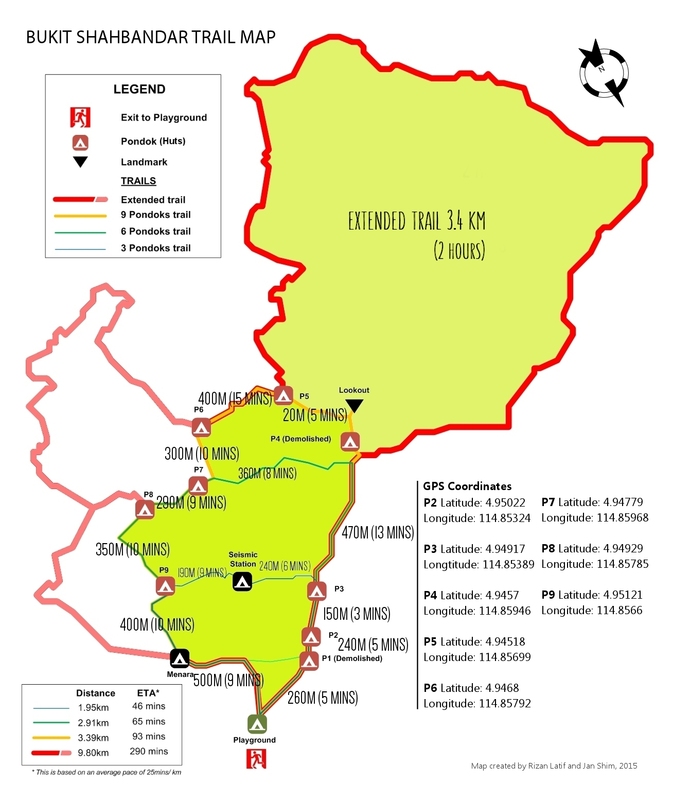 I did a quick google search of Bukit Shahbandar trail map and got links to this blog. We downloaded PDF version of the map and the MapMyHike map and app, with the view that if anything goes wrong or the trails being unmarked, then we could use the GPS on our mobiles to find our way. So, we set off on Monday morning, starting our hike around 9am, from the playground (we parked at the playground entrance), came to a first junction at the end of the playground: to the left was a sign saying menara and the right, a set of concrete steps – we decided to go up the concrete steps. The both of us were not particularly unfit (we go to the gym about 2-3 times a week), but the steep elevation was quite testing and first thing in the morning too (it was a bit of a shock to our system!). But we pressed on and soon, after the concrete pathway ended, we came to what looked more like jungle trail and the first intersection, clearly sign-posted telling us the direction to menara and pondoks. Now, at this point, if we had looked at the map provided by Jan Shim (we printed it out the night before – but we completely forgot about it) then we would have had a better understanding of our bearings/location and what the trail would entail, but instead, we focused on following the direction the sign posts showed us, thinking we might try and see where we end up following the park’s original map. Also, the app, MapMyHike, installed on my boyfriend’s phone, stopped working. I couldn’t download the app on my Samsung Galaxy S2 – guess my phone was too old. So we decided to just focus on following the sign posts. So, from here on, I shall detail our experience of using the park’s original map (each pondok/intersection where there are no pondoks has a map) – NOT Jan Shim’s map. The annoying thing about the park’s map is that, the pondok numbers are not marked, but it does tell you where you are on the map, so you more or less know where you are – even if you don’t know which number pondok it is. But the signposts tell you which pondok you are heading towards and how far – so you assumed you are heading in the right direction towards so-called numbered pondok and how long until you bump into it. So, if it tells me 20m to next pondok, if I have been walking for 15 mins and cannot find a pondok, I can assume I have followed the wrong trail and am now hopelessly lost – maybe. However, a couple of the pondoks were demolished – so we did end up losing count of what pondok we were at. So we pressed on to the next pondok (I think it was pondok 2) everything going well so far and the trail was easy enough to follow – it was obvious where the path to go was, then at pondok 3 there was that awesome view overlooking the Jerudong beach area. No hitches so far. At the next intersection (there was no pondok there, but it’s supposed to be pondok 4), there were two routes for going to pondok 5, to the right gives a distance of 3000+ metres and to the left – I can’t remember what the distance was, but it definitely wasn’t 3 km. The choice was easy for us, it was our first time and we didn’t want to get stuck in a 3km trail. So we found the next pondok (pondok 5) without any trouble. The next pondok was where we ran into a slight glitch. Because we saw a sign post next to the pondok giving the direction to pondok 8 (500+ metres) to the right and exit (some other distance) to the left. The map at this pondok was destroyed and burned (it looked like it was hit by lightning – no surprise there, being on top of the hill and secured by a metal conductor – bound to happen), so we couldn’t really get our bearings of where we were. I was a bit apprehensive about the 500 metres distance to the next pondok when the previous ones were quite nearby each other. I know 500 m is nothing when you’re walking in a straight, level plane, but 500 m plus elevation could be hard work. But seeing as how we couldn’t see anything else, we pressed on. So, we followed the trail, it seemed straightforward to begin with, then it started sloping downwards and after about 15 mins, we reached the bottom of the hill onto a muddy tiny stream and after crossing that, we couldn’t see any clear trail, we traced our step back 5 minutes to see if we had made a wrong turn, but we couldn’t really see where we went wrong. At this point, we tried getting the GPS, but it didn’t work – I guess because we were at the bottom of the hill and there was no reception. We then decided to head back on ourselves, back to the previous pondok and tried to see if there are any other directions showed aside from the exit, but to no avail. I think by this point, I was keen to finish the trekking – so we headed for in the direction of the exit. Ironically, following the exit direction, we ended up at pondok 7 (we thought the previous one was pondok 7 because the arrow said “to pondok 8”). At this pondok, we saw another signpost saying “to pondok 8” with a much shorter distance than the previous pondok. Unfortunately, by this time, our enthusiasm was dampened by the lack of effective pondok numbering on the map. Also, we noticed the distance shown on the map on the pondoks do not match the distance shown on the sign posts – which again made things a bit confusing. So again, we headed for the exit from this pondok – which led us back to pondok 4. Now, if we had looked at Jan Shim’s map, we would have realised that we were taking the longer way to exit. If we had pressed on to pondok 8, then 9, it would have been a shorter distance to the actual exit. And we wouldn’t have felt like we have failed to complete all 9 pondoks. Oh well, c’est la vie, we learned our lesson.